I think I can finally admit that I love hair. I am a licensed hairstylist and I love to create new looks with hair. I truly believe that healthy hair is the best hair and that is most important about hair. I am natural underneath all my extensions and have been natural for about 6 years now. What really had me to go natural was due to over processing my hair due to chemical relaxers. Relaxers broke my hair off and made my hair so thin....... and on top of that I found out that I am allergic to them. Its not normal for my scalp to be sore, tender, and irritated due to a chemical so I had to become chemical free. I had the Rihanna bob before Rihanna was on the scene. Back in 2006 I had my bob and I had to consistantly keep it relaxed and after a month of my bob I decided I wasnt going to put another relaxer in my hair. I decided to grow my hair out at least 4 inches before I did the BIG CHOP. I decided to braid my hair and weave it up. After about 4 months I had significant new growth and I chopped off all my relaxed ends thus allowing my natural hair to grow. I was determined no matter how coarse and tangled my hair would get I would not relax it again. 6 years later here I am. I went to hair school already knowing how to style hair I just needed a license for it. Once I completed it I really focused on sew in weaves. At that time sew in weaves were so expensive and as a single parent I couldnt afford to go to a salon to get them done so I weaved my own hair until I crafted my skills. Now let me tell you..... When I started weaving hair my weaves looked likes weaves but as time progressed I got better and better. Once I got pretty good people would ask me who did my hair and I would tell them I did. That is how I started building my clientele. One person turned into many and I couldnt believe how many people loved what I did to their hair. It was rewarding to me knowing that I could make someone feel better about themselves. 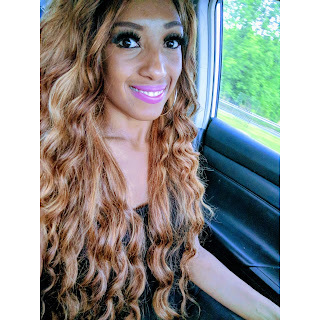 I had to learn about extensions because I was so used to spending $300+ a month in beauty supply store hair and one of my friends at the time introduced me to Black Hair Media. http://forum.blackhairmedia.com and I was amazed about Virgin hair. At that time members posted pictures of their hair and where they purchased it from I was in awe! I learned so much about others journey about hair how it is best to buy quality hair one time and to invest into your hair. I hosted a huge group order for hair and it was huge. I wasnt expecting to get so many responses and replies for hair and I was happy to share with others what I learned about hair and quality hair. Again the good old days. After my 2nd group order I decided to go with another vendor because length of my 2nd order was short inches and it wasnt the same as the first order. I wanted to share a snippet of my hair journey and photos and I hope this inspires anyone to go for whatever look makes you happy. Underneath my weave is natural hair and I take care of my hair by keeping it in its natural state. That is works best for me and my scalp. Dont be afraid of extensions and remember that health of your hair is way more important than any weave or style created. Dont be afraid to try something new or different and dont be afraid of others reactions. If I allowed my fears of what others said about my hair I wouldnt be where I am today. I decided to share some of my looks and hair that I actually wear and install myself. I will do a tutorial on my blog with details on how to create these looks.